M. Schreberi Gmel. Syst. Nat. 2: 171. 1791. M. diffusa Willd. Sp. PI. 1: 320. 1798. Glabrous, culms 1°-3° long, decumbent, or often prostrate or creeping and ascending, very slender, diffusely branched. Sheaths shorter than the internodes, loose; ligule short, fringed; blades 1 1/2'-3 1/2' long, V-2" wide, scabrous; panicle 2'-8' long, slender, somewhat lax, its branches 1'-2' long, erect; outer scales of the spikelet minute, the lower one often wanting; the third scale, exclusive of the awn, about 1" long, strongly scabrous, particularly upon the nerves; the awn 1/2"-2" in length. On dry hills and in woods and waste places, Maine to Minnesota, south to Florida and Texas. Aug.-Sept.
M. palustris Scribn. Bull. U. S. Dep. Agr. Agrost. 11: 47. 1898. M. Schreberi palustris Scribn. Rhodora, 9: 17. 1907. 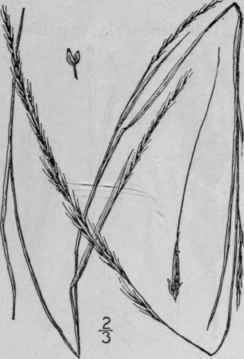 Culms slender, weak, 2°-3° long; sheaths smooth and glabrous; blades erect, l'-2' long, about 1" wide, smooth beneath and rough above; panicle slender, contracted, 4'-6' long, its branches appressed; spikelets, exclusive of the awn, 1 1/4"- 1 1/2" long, the first scale about 2/3 as long as the second which is i as long as the spikelet, the flowering scale about 1 1/4" long, shortly 2-toothed at the apex, and bearing an awn between the teeth 3-4 times its length, the callus hairy. In swampy ground, District of Columbia and Illinois. 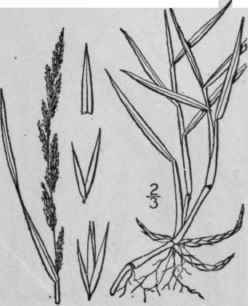 Sept.
Agrostis sobolifera Muhl. ; Willd. Enum. 95. 1809. Muhlenbergia sobolifera Trin. Unifl. 189. 1824. Glabrous, culms 2°-3° tall, erect, slender, simple, or sparingly branched above, smooth. 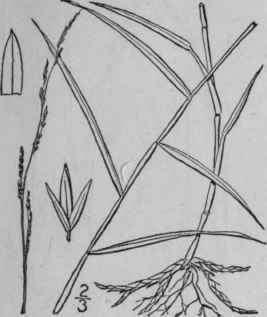 Sheaths smooth, those of the culm shorter than the inter-nodes, those of the branches overlapping and crowded; ligule very short, truncate; blades rough, those of the culm 4'-6' long, 1 1/2" - 3" wide, those of the branches 1'-3' long, about 1" wide; panicle 3'-6' in length, slender, its branches 3'-1' long; outer scales about 1/2" long, half to two-thirds the length of the spikelet, equal, or the lower somewhat shorter, acute, scabrous, especially on the keel; third scale scabrous, obtuse, 3-nerved, the middle nerve usually excurrent as a short point. Rocky woods, New Hampshire to Minnesota, south to Virginia, Tennessee and the Indian Territory. Sept.-Oct.
Agrostis mexicana L. Mant. 1:31. 1767. Agrostis filiformis Willd. Enum. 95. 1809. Muhlenbergia mexicana Trin. Unifl. 189. 1824. M. foliosa Trin. Gram. Unifl. 190. 1824. Glabrous, culms 2°-4° long, erect, or often prostrate, much branched, smooth. Sheaths shorter than the' internodes, excepting at the extremities of the branches, where they are crowded and overlapping, smooth or scabrous; blades scabrous, those of the culm 4'-6' long, 1"-3" wide, the branch leaves smaller; panicle 2'-6' long, contracted, its branches spike-like, 1'-2' long, erect or appressed; spikelets 1 1/4"-1 1/2" long; outer scales somewhat unequal, exceeding the flowering one, or slightly shorter, acuminate or short-awned, scabrous especially on the keel; third scale acuminate, scabrous, particularly toward the apex. In swamps and borders of fields, New Brunswick to Wyoming, south to North Carolina and Texas. Knot-root grass. Aug-Sept.